Once upon a time I, Lighting's Girl, was quite a fan of Archers of Loaf (still am) and saw them play live back in the day as often as humanly possible. If I had to name a band I saw in a live setting the most in my (thats me to the left) lifetime I would say Archers would make it into the top three - easy. Here is a funny picture of me at one of their shows at Brownies in NYC singing along in what looks like a cross between ecstasy, rage, and constipation. The really funny part about this picture is their label at the time turned into a giant tour poster around the same time my old band was touring. We would pull up to a venue or record store and there would be this terrible picture of me up in some window or on some wall as big as car windshield. And if you find yourself asking who is Archers of Loaf and what record should I check out the answer is simple: Icky Mettle is one of the ten best American indie rock records of the early 90's. Spazzy, angry, melodic in a backhanded way - think Built To Spill but more untamed and tipsy. I could argue that they are one of the best things to ever come from Chapel Hill. I love them so much that I am even willing to eat their Fenders and now I have a picture to prove it. It all comes rushing back! You were on that huge poster. That was very funny, at the time, and now. Icky Mettle does stand the test of time, it still sounds great to me. 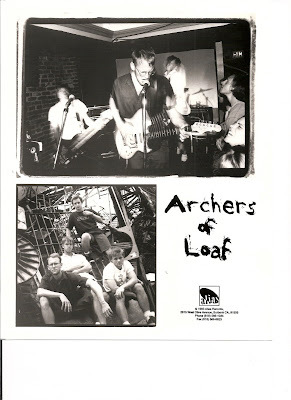 I had pulled my Archers of Loaf records, besides the first 7", out for sale. Then their early albums started getting some play in the store last year and I, in the office, found myself in high nostalgia mode. Said records found their way back onto my shelves shortly after. Not an exciting story, but relevant, no? And you wonder why I haven't made a proper post yet. Isn't the record called Icky Mettle? Or am I just making that up? They played at Notre Dame at least once, probably twice, when I was in school there. Did I go see them? No. I wasn't a full-fledged indie-rockin' snob just yet. Plus, I was hella busy trying not to fail out. I heard they always played really short shows, is that true? Yeah - I did not spell the title correctly. I can't spell things correctly on a good day no less on 4 hours of sleep post trip to New Orleans on top of 14 hours just spent at a work convention with the Navy. The combo has made a noodle of my brain. So tired. So very very tired. I am actually still in a friggin hotel - ARGH! Archers shows were very very very hit or miss. It depending on how drunk some of them were. Some shows where longer than others but they were never a band who played like 2 hours or something. I tend to hate seeing even my favorite band play more than 12 - 15 songs so Archer's were usually more in that zone. I think that is PERFECT but perhaps to some that is short. Well, you know I love this record. As a matter of fact I proclaimed that to you very recently haha...good post and a great band. Dave - you are why I pulled out that record again! Go you! When I pulled out the record the poster and picture were tucked in there. I often file things in records if it relates to a band so sometimes I find all sorts of crazy things like a postcard from Joe Preston or drawings from Seaweed ...random silly stuff I have totally forgotten about. I will try to post more of that junk as I find it.